I like Laughlin, at least during the winter months. 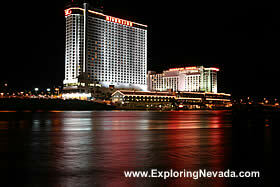 Located at the southern tip of Nevada, Laughlin is a fun place to visit. Despite the small size of Laughlin, most people have heard of it since it (and neighboring Bullhead City, AZ - which is located across the river), are often in the news due to having the "nation's high temperature." Indeed, Laughlin is a toasty place to visit - at least during the summer. The average high is above 100 degrees from May through September. Of course, the flip side of this is that during the winter and spring, Laughlin has wonderful weather and provides a great getaway from the cold weather found elsewhere. Better yet, Laughlin is still affordable. While the past few years have seen Las Vegas become increasingly "high-end", with ever escalating prices of hotels, food and entertainment, Laughlin has maintained is still an inexpensive place to visit. During most of the year (special events excluded), rooms can often be had for $50 or less (during my last visit I paid $19 a night!). All the casino's in town also have many options for affordable restaurants and buffet's. And unlike Las Vegas, penny and nickel slot machines are still easy to find. In many ways, Laughlin reminds me of a much-smaller version of what Las Vegas used to be. 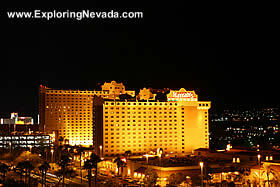 Additionally, Laughlin's location makes it ideal for people who want to venture outdoors and away from the casino's. As Laughlin is located along the Colorado River, the casino's have built a riverwalk that connects most of the waterfront casinos and parks. Once the high heat of the day disappears, the riverwalk is a great place to get some exercise and take in the nice views of the Colorado River. Laughlin also has a nice location for other outdoor activities. With the Colorado River running right through town, boating and fishing are very popular. Additionally, Laughlin is very close to Lake Mojave. And for those feeling a bit adventurous, a short but scenic drive awaits on the Christmas Tree Pass Scenic Drive. The population of Laughlin is quite small, being right around 10,000 people. However, right across the Colorado River in Arizona is Bullhead City, which has a population of around 40,000 people. Bullhead City supplies much of the labor force for the casino's, too. Somewhat surprisingly, Laughlin is one of the most popular RV destination spots in the USA. Exactly why, I have no idea beyond the nice weather Laughlin has during the winter. But it's popularity among RV'ers is obvious, as RV's and RV parks are everywhere in town. Overall, Laughlin is still a fun and affordable place to visit. It's more family friendly, not to mention far more affordable, than Las Vegas is. And it's small size, combined with the river walk and plenty of sidewalks, make it easy to wander around from hotel to hotel. Although Laughlin doesn't have the glitz, glammer or high-end shopping like is found in Las Vegas, for those looking for an affordable and laid-back winter vacation, Laughlin is a great choice.